(THE JAPAN NEWS/ ASIA NEWS NETWORK) - Bouquets of vegetables in various colours are not only beautiful but also have a unique feel that is different from that of bouquets of flowers. It’s also great that we can eat them after using them as ornaments. 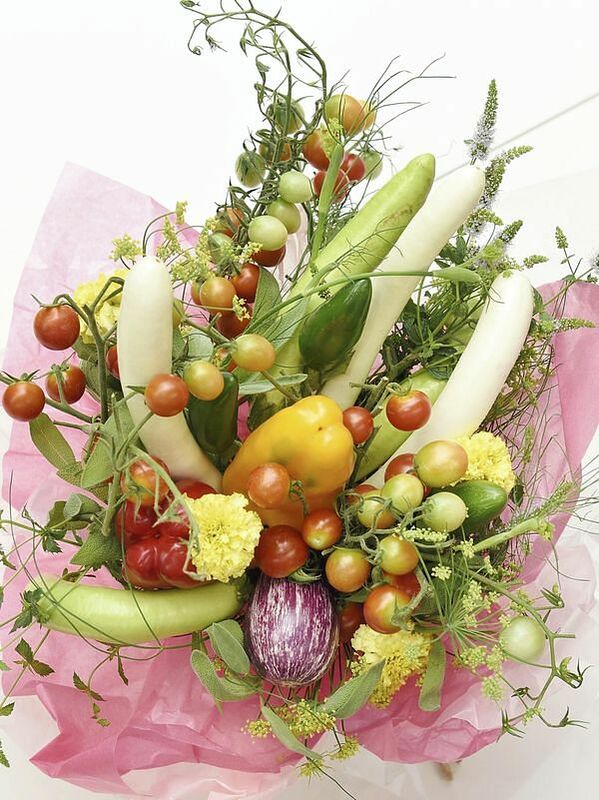 Vegetable coordinator Michiyo Koyama has made bouquets of vegetables since 2006, giving them the name "veggie bouquet". They have versatile uses, such as birthday gifts, taking to home parties and as housewarming gifts. “Veggie bouquets can be a good conversation starter among people about what vegetables are used, guessing their names, and so on,” Ms Koyama said. She also said that veggie bouquets are sometimes held by brides at wedding ceremonies and used to decorate tables at wedding receptions. Ms Koyama took up farming about 20 years ago after working as a flower bouquet designer. She gives lessons on how to make vegetable bouquets and sells her veggie bouquets. She has published a book for beginners on how to make the bouquets. I asked Ms Koyama to make some that used a variety of vegetables. The first one included cherry tomatoes, bell peppers, white eggplants and herbs. The colours of the vegetables accentuated each other and the vitality and beauty of the bouquet was impressive. “As I included herbs, you can enjoy their refreshing aroma, too,” Ms Koyama said. Another bouquet was in chic base colours, and included black bell peppers and purple basil, and was accentuated by bitter gourds with a rough appearance to give a somewhat rustic impression. A work featuring carrots, onions and potatoes can be immediately used as curry ingredients. The bright green of bay leaves was refreshing. It is also fun to make bouquets for special events or occasions. A cute bouquet meant for Halloween was made of pumpkins in various sizes as well as bell peppers, each bearing stickers in the shape of eyes and mouths. According to Ms Koyama, vegetables suitable for bouquets are those that last longer at normal room temperature, such as eggplants, carrots and bell peppers. To eat the vegetables after decorating them, you should choose ones as fresh as possible. Vegetables sold at farm stands for direct sales or grown in home vegetable gardens often come with leaves and stalks. Such vegetables are particularly suited for making bouquets. For vegetables that do not come with stalks, stick bamboo skewers into them to act as stalks while making sure not to damage edible parts too much, and then bundle the skewers together. Vegetables sold at supermarkets can be made into bouquets, too. To make a simple one suited for beginners, place turnips and carrots in the center, and surround them with cherry tomatoes, radishes and purple basil. Discover the beauty of vegetables by making bouquets with them, then you may come up with new ideas for cooking. Vegetables are suited not only for making bouquets but also for wreaths. A wreath using red and yellow chili peppers, garlic and bay leaves looks as beautiful as a bouquet of flowers due to the bright colours of the chili peppers. As all these materials last for some time, you can hang the bouquet in the kitchen as an ornament and use some of them each time you cook. There can be many other variations, too, such as a tapestry of carrots and chili peppers and a corsage of yuzu citrons. Visit Ms Koyama’s website for more information.